The structure differs in several aspects from the cross on f. 2v. Like said cross, this one is set beneath a horseshoe arch. The interwoven motifs are unusually over elaborate although the aesthetic results are highly successful. Bases and capitals constitute interwoven motifs as does the keystone of the arch. Interwoven motifs are applied to the ends of the arms of the cross, the insides of which are covered by artistic piping. Interwoven motifs also decorate the base of the Oviedo Cross. Hanging from the horizontal arms are a very ornate alpha and omega, and stretching upwards in front of them are two stems topped by floral stylisations giving the impression of two lamps. This interwoven decoration is taken directly from the cross in the Liber Commicus of San Millan, as is the two-line legend appearing at the bottom in capital letters SIGNVM CRVCIS / XRISTI REGIS. According to Boylan, the ruling on f. 3 was done after the cross was painted on f. 3v possibly at the time the Antiphonary was added. 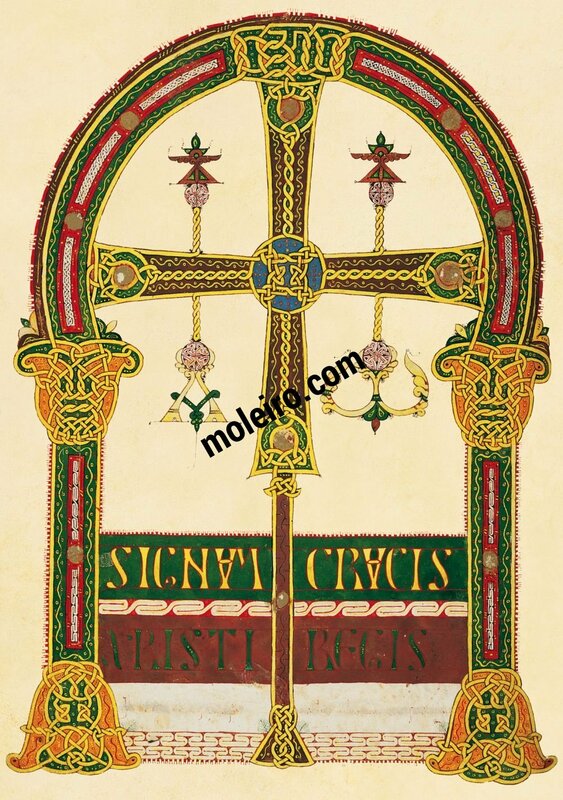 According to said researcher, the cross does not belong to a manuscript other than the Antiphonary and which – on the basis of artistic comparisons with the cross in the Liber Commicus – she deems to have originated in the San Millán de la Cogolla monastery.